Are you worried about historically low interest rates? These ETFs can materially increase your returns in retirement. Interest rates in many developed markets are at historically low levels, and that can be a problem for retirees, who are struggling to make enough money from their portfolios in the current environment. However, that's no reason to despair. As long as you keep your portfolio well diversified across different asset classes and closely monitor your overall risk exposure, the following exchange-traded funds can be powerful vehicles to make more money in retirement. Investing in preferred stock can be a smart strategy to generate more income from your retirement portfolio, and iShares US Preferred Stock ETF (NASDAQ:PFF) is a solid investment vehicle to implement such a strategy. The ETF invests in a basket of nearly 290 preferred securities, and it pays a dividend yield of 5.6%, which isn't bad in a time when the 10-year U.S. Treasury bond yield is in the area of 1.6%. Like common stock, preferred shares represent ownership in a company. However, this kind of security also pays a fixed dividend that needs to be paid out before the company can distribute any dividends to common shareholders. For that reason, preferred shares are generally considered a hybrid between debt and common stock. iShares US Preferred Stock ETF is heavily concentrated in the financial sector, an important consideration to keep in mind. Banks account for 40.3% of the assets in the portfolio, diversified financials 17.1%, real estate 13.5%, and insurance 8.9%. If companies in the financial sector go through a difficult phase because of economic headwinds, it will most probably have a negative impact on iShares US Preferred Stock ETF. On the other hand, since the banking crisis in 2008, companies in the financial industry are facing increased regulations and higher capital requirements, so debt levels are decreasing and balance sheets are getting healthier. This is a positive trend for iShares US Preferred Stock ETF, since it reduces risk for investors in preferred shares. iShares US Preferred Stock ETF has an annual expense ratio of 0.47%. While that's not among the lowest annual expenses available to investors in ETFs, the expense ratio is not excessively high, either. Investors in retirement tend to gravitate toward dividend stocks, and for good reasons. Dividend stocks provide a nice combination of current income and potential for capital appreciation, and companies with consistent dividend payments tend to be more stable and reliable. It takes a financially sound business to reward investors with sustained dividend payments for the long term. Vanguard High Dividend Yield (NYSEMKT:VYM) invests in a basket of more than 425 companies selected on the basis of their dividend yields and size. The portfolio is smartly diversified across different sectors: Consumer goods accounts for 15.8% of assets, technology and financials both represent 13% of assets each, 11.8% is invested in healthcare, and industrials represent 12.5%. Diversification can do wonders in terms of keeping risk under control. When one industry is going through a challenging phase, better performance in other sectors can provide stability to the ETF as a whole. In addition, the average company in the portfolio has a relatively big market capitalization value of around $135 billion, so size is another factor providing stability for investors in Vanguard High Dividend Yield. The ETF is paying a dividend yield of 3.2% at current prices, and the annual expense ratio is a conveniently low 0.09%. According to Vanguard, that's 92% lower than the average expense ratio of funds with similar holdings. Many investors in retirement tend to stay away from tech stocks, since companies in the sector are typically more cyclical and volatile than other asset classes. However, the tech sector is also home to many of the most innovative and disruptive companies of our time, potentially driving superior returns over the long term. By investing in tech stocks through ETFs, investors can capitalize on the innovative power of the technology while keeping company-specific risk at bay through diversification. Vanguard Information Technology (NYSEMKT:VGT) invests in a basket of more than 380 large-cap tech companies. The average stock in the portfolio has a market cap of around $146 billion, and it includes many of the most recognized players in the tech industry, such as Apple, Alphabet, Microsoft, and Facebook, among several others. Vanguard Information Technology has a remarkably low annual expense ratio of 0.1%, 93% lower than the average expense ratio for other ETFs investing in a similar portfolio. The dividend yield is around 1.4%. For reference, the average company in the S&P 500 is currently playing a dividend yield of 2.4%, so Vanguard Information Technology is not a particularly attractive choice for investors looking for income. 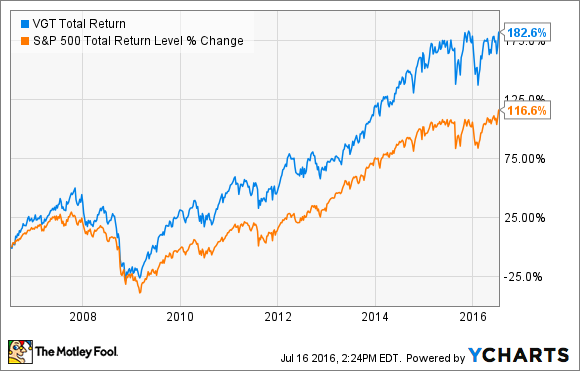 On the other hand, Vanguard Information Technology has materially outperformed the S&P 500 index on a total return basis over the last decade. Past performance is no guarantee of future returns, but tech companies tend to offer superior growth prospects, so it makes sense to expect higher returns from companies in the tech business over the years to come.